You can see right away that the Congo is an outlier: It started the 1970s with roughly the same mortality rate as sub-Saharan Africa as a whole, but gradually lost ground. The Congo loses 109 children per 1000 live births, compared to only 64 for Africa as a whole. But what do those numbers translate to in terms of real human beings? About 2,660,000 babies are born every year in the DRC. If some 116 out of every 1000 of them die , that means roughly 309,000 perish each year. If DRC's infant mortality rates were the same as SSA, it would lose only 194,000--or roughly 114,000 less. Compared to Kenya, DRC loses roughly 149,000 infants. 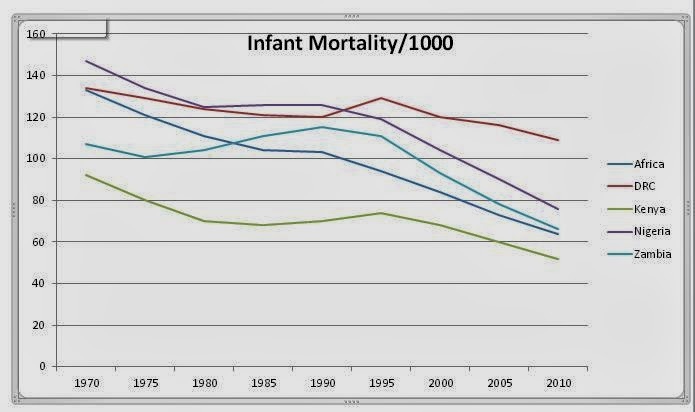 And if the DRC performed no better than Nigeria, it would still lose 70,000 fewer babies each year. I am using 2005 statistics rather than 2010, which are projected, not actual. Very good point and this is just one tragic example. The same can be said about maternal death let alone the backlog of skills shortage occasioned by decades of neglect of the education sector. I fear the implications of past bad governance in the DRC are yet to show their full extent. Wow. Your dedication to the Congo is striking.